As a designer and as a part of the larger architectural team here at Danielian Associates, we are guided by a design philosophy that believes buildings should speak to people and engage their emotions. We continually strive to create spaces where memories and stories are created with respect to sustainability and the authenticity of the community. 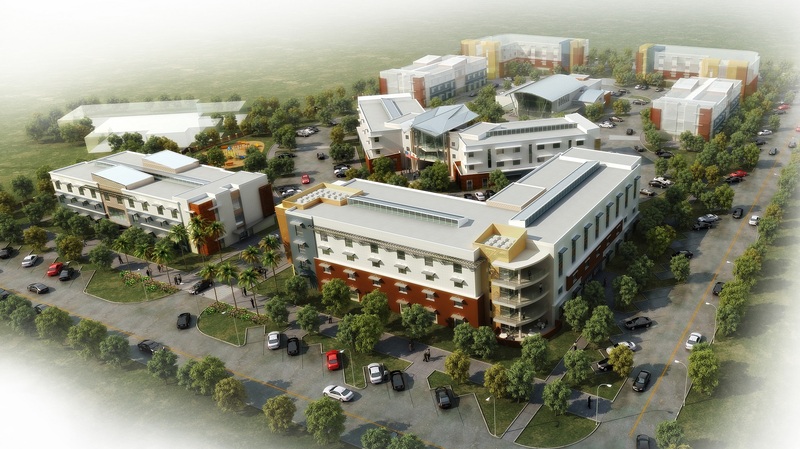 One exciting example of this altruistic design philosophy is the March Vets Village in Riverside, California. This project is a joint venture between the US Vets Initiative and the Coachella Valley Housing Authority that had started back in 2010. After years of funding challenges, the project finally achieved its ground breaking last year and truly exemplifies the definition of teamwork. Now well into construction, the facility will ultimately provide housing to homeless and/or at risk veterans as part of a transitional program that will including counseling, support services, and training for individuals as well as families. The design ideology was derived from its contextual relationship to the historic March Air Force Base – in recognition of service and patriotism alongside a symbolic nod to rebirth and flight. An iconic wing element in the central building serves as a focal point to the campus and highlights the entrance, as most of the programs and services will be located within that space. In conjunction with the architectural authenticity, the project is adhering to sustainable building practices under the guidance of Green Dinosaur, Inc. who is providing the sustainable consulting services, program administration, energy modeling, verification, rating, and building commissioning. March Veterans Village is targeting LEED for Homes Silver Certification, thanks to advanced framing techniques, exceeding T-24, high performance fenestration, ample daylighting, high efficacy lighting, low flow water usage fixtures, and an effective waste management and recycling plan that will reduce construction waste by a minimum of 50%. The landscape architecture was designed to significantly reduce water usage for the entire site while enhancing the design elements of the building themselves. California native and drought tolerant plant palettes were selected to compliment the colors and materials of the buildings. Additional plantings next to the buildings provide shade and help shield the building from heat during the hot afternoon sun. Danielian Associates recently wrapped up another sustainable housing project for a US Vet, the ABC 3.0 Green Home in Fullerton. This is just scratching the surface and represents only a small percentage of what we can potentially do. There is still so much to be done to help our US Veterans, the opportunity to provide quality housing is just a very small piece of the puzzle. Reflecting on the well-deserved families and individuals that will have their needs met by the March Veterans Village, I am concerned with the countless others that are still very far from that realm of housing opportunities. I look forward to the day with this story will perhaps come full circle, when the support these deserving families receive ultimately enables them to qualify for their own home. Until that day we will continue collaborating on veterans housing projects and designing sustainable, affordable housing opportunities.